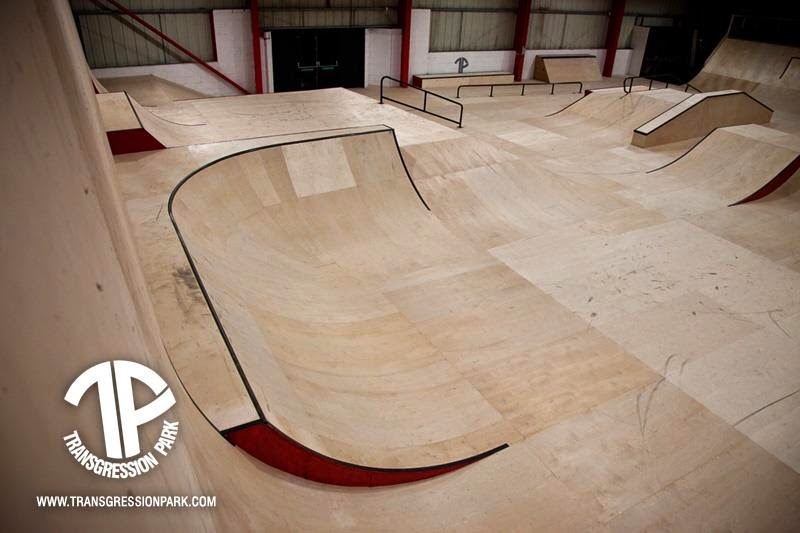 "We are a Skatepark based in Edinburgh UK www.transgressionpark.com and are working hard to get more females into BMX. We are just about to move into a new location which will offer a great indoor park, outdoor trials, flat land area, bmx race track out door park if you guys are ever over in Scotland please look us up and come sesh." 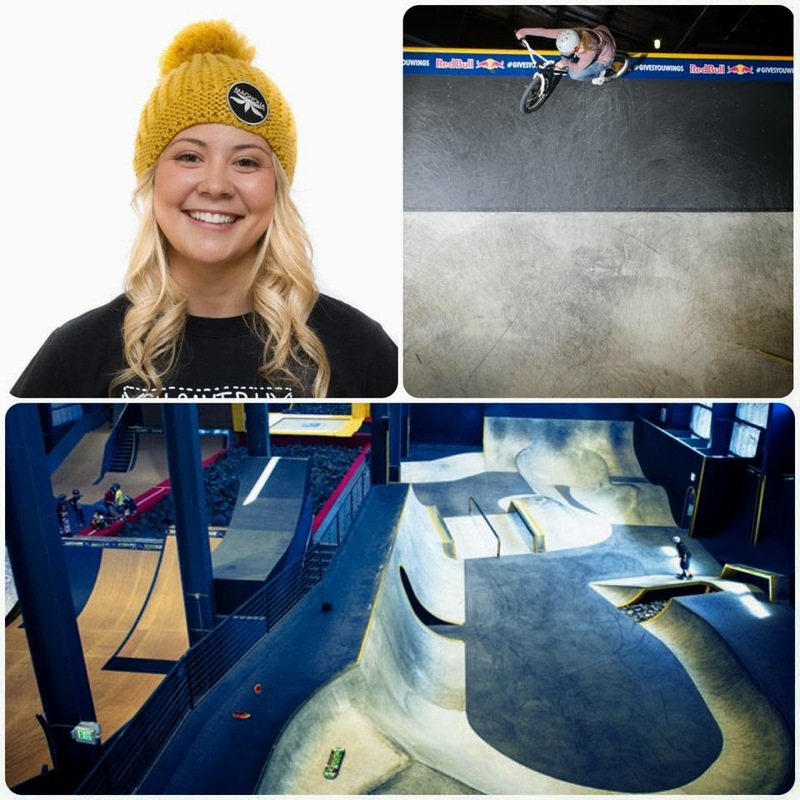 Kayley Ashworth on Transgression "Transgression skatepark have been fantastic with encouraging girls to try BMX, they've held girls days and provide a relaxed environment. I held my friends surprise hen party there! 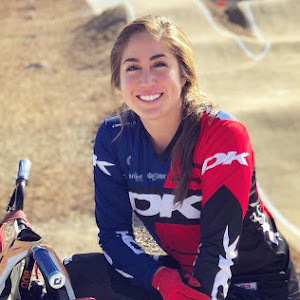 Haha"
This Summer will see BMX join Girls Week at Camp Rubicon for the first time ever – so from July 28th to August 1st, you can join a week long residential bmx camp just for girls. 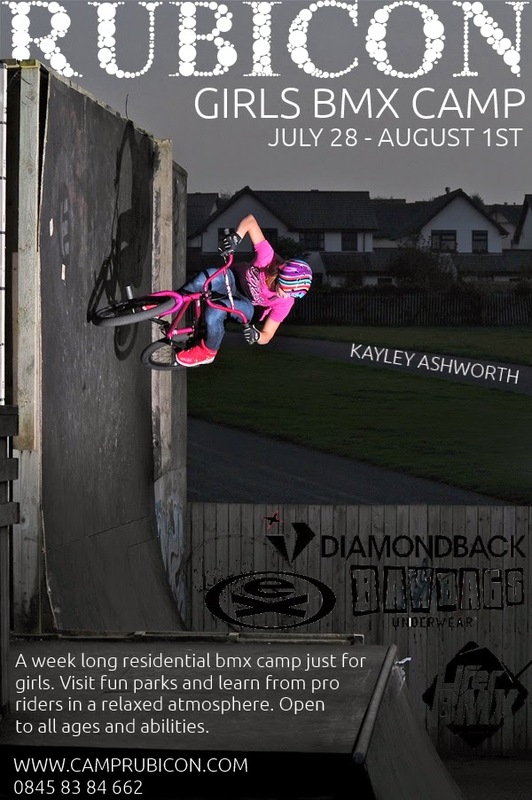 Open to all ages and abilities – its your chance to visit a whole bunch of different skateparks and learn from sponsored riders like Kayley Ashworth (Diamondback, Bawbags, Extreme, Lifer BMX) in a relaxed and friendly atmosphere. Based in the UK (near Birmingham) – last year they had girls come from all over the UK (and other countries too) to take part in Girls Week, visit new parks, make new friends, learn new tricks and have a lot of laughs! They’re also busy talking to lots of cool sponsors so that all girls will receive a great goodybag of product thanks to them! So whether you come by yourself or grab your friends – be sure to add it to your Summer plans – for the best holiday ever – a bmx adventure! For girls coming from abroad – it’s easiest to try and get your flights to Birmingham – but if you do come to London then its just a 2 hour direct train journey away. Get in touch with them if you need help with travel plans. It's a super exciting development because the last two years of Girls Week (where they have skate, inline, bmx and scoot camps all together) have always been the highlight of the Summer! Although American born, Amanda holds a dual USA and Thai citizenship because her mother. 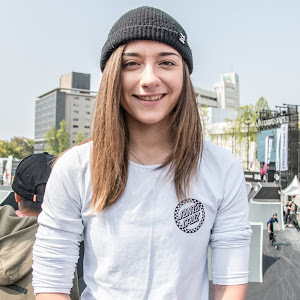 In 2013, Amanda became a member of the Thai Cycling Association and the Thailand BMX National Team, giving her the opportunity to participate in the development of BMX in Thailand, throughout Asia and to compete around the world in all UCI BMX World Cup Supercross races, BMX World Championships and other UCI sanctioned events, earning nation ranking qualification points for Thailand. 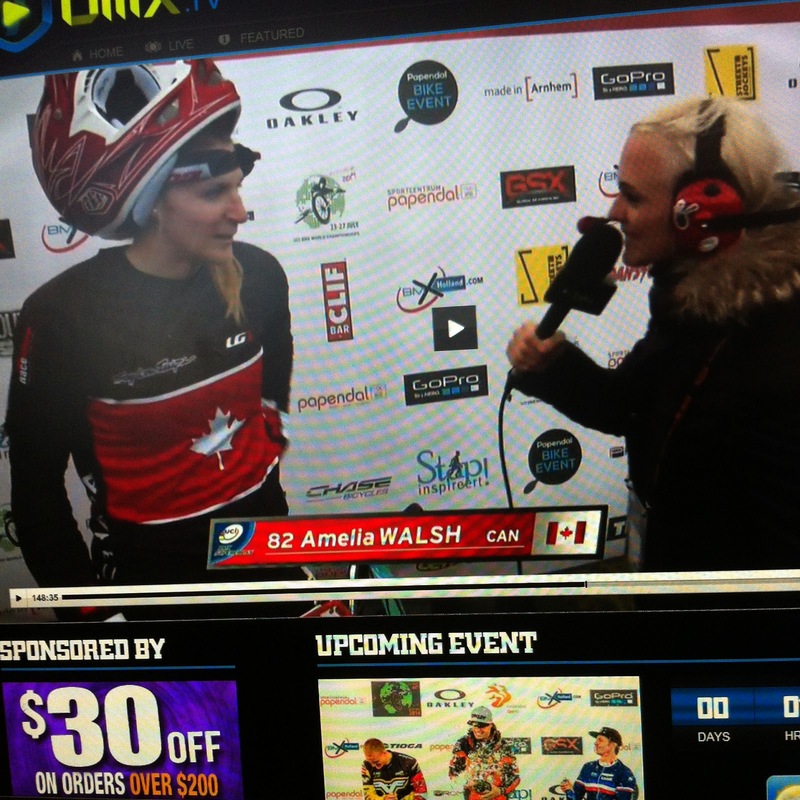 Check out this little interview we did with Amanda Carr below. What are some characteristics you find that differs American to Thai racers? Personally I would recommend USA, there is no other country in the world that has over 400 tracks with so many different series one can compete in, like District/State/Regional/National quiet like USA BMX. USA BMX Riders are so fortunate that we have the luxury to literally CHOOSE how serious we want to be about our sport, if you want to race only State Races go for it, or if you want to qualify for the World Championships go for it, it's your dream and USA BMX allows you to focus on what you want to. Haha, this is always a great question. Depends on where in the world I am :) If I'm at home in Florida I usually have 2 workouts each day, some days consisting of driving 45min each way to my Coach. Also, I am serving my 3rd year as Charlotte BMX Track President so I spend about 1-2hrs each day doing something either manually or office work related with that, I really enjoy this! If I'm traveling, to a SX Race it usually goes like this Tues-Travel Wed-arrive/pack/stretch/light physical activity Thurs-Practice Fri-Qualification Race Sat- Race Sun-Fly Home. If I'm in Thailand well depends on what I'm there for, if I'm there for a BMX Event it's usually a lot of media, business, and BMX Track visits. If I'm in Thailand visiting family, I'm always doing something that seems primal each day whether is catching frogs in the rice fields or fishing with a bamboo stick haha! Regardless of where I'm at, I'm usually on the go if I'm not on the go I'm sleeping :) I always have something on my schedule I enjoy being on the move. I didn’t tune into the UCI BMX Supercross in Manchester, but from the twitter updates something happened. Are you ok? What’s a big event like this like and did you meet your expectations? Manchester was okay, I fell the first round which set me back with 8 points and then laps 2 & 3 just didn't seem to get any better. My body is fine, just mentally I am super hard on myself so there's always room to improve. A big event like a Supercross is more mentally taxing than physically in my opinion. I mean at this level we all have the physical capabilities to succeed, so it really leaves the mental state at the steering wheel. 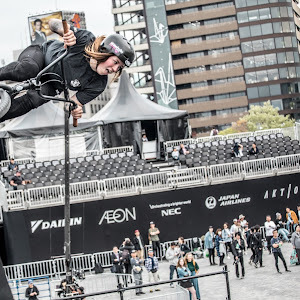 It's hard to explain the magnitude of a 8m/26ft BMX Start ramp with 35+ft gaps down the first straightaway unless you've ACTUALLY been to a SX Race, video and pictures don't justify the size of what SX Riders are competing on. Did I meet my expectations, no, but I rarely do because I set them so high. My goals will forever be evolving. 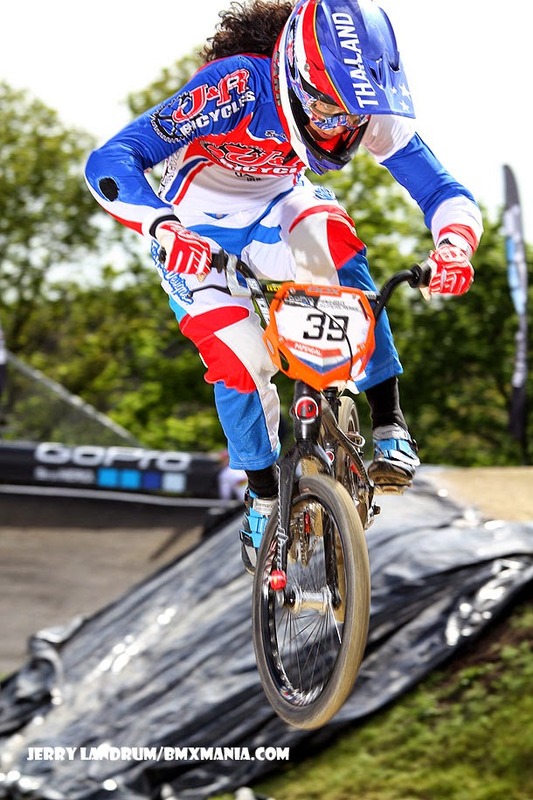 What’s the best and worse thing about being a professional BMX racer? Best thing about being a Professional BMX Racer, I would have to say is the traveling. I talk to my friends and family and they always remind me of how fortunate I am to be able to travel the world! We grew up in a world, where "follow your dreams" was limited to Disney movies and motivational posters, but rarely from our own parents. Even with two young boys, life and responsibilities, Adam and Rebecca Pergentile still make time to do Flatland demos and motivational talks, sharing their passion and inspiring others. If you're interested in booking them for a demo, head over to our contact page! HANG OUT WITH PERRIS BENEGAS! Yo! What're your plans for June 29 - July 5!? How about you come hang out with Perris Benegas for Girl's Week at Woodward Tahoe. Fellas, you are also welcome to come ride and join the fun. Again, week 3, June 29 - July 5. MARK YOUR CALENDARS it's going to be a blast! This is seriously THE BEST competition video that I've ever seen between two ladies. 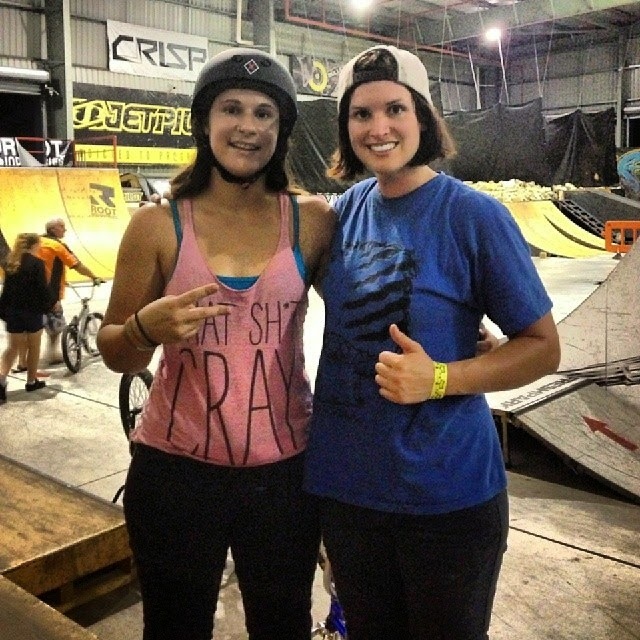 Check out Peta Shepherd and Natalya Diehm go head to head at the Queensland's Female Freestyle BMX comp.